Traditions get passed-on in a multitude of ways. In hunting, typically, our grandfathers introduce our parents, our parents introduce us and we one day pass it down to our own children. In my case, it was all jacked-up. It was early in the 1990’s when my turkey hunting bug bit. I was a teenager, in Jr. High School and an avid small game hunter and deer hunter with both rifle and bow. I thought that deer hunting was as good as it gets. To this day I love deer hunting, but it is a distant second to my true passion, turkey hunting. It was 1991. Turkey hunting was on the verge of going mainstream. But in these years, in this place, it had just started. There was one guy in my home county that was known as the turkey master. He was the only guy in the area that consistently hung longbeards in the apple tree. I was lucky because that guy was my great uncle. His name is Seibert Pertee. Many have met my uncle who is now 71-years-old and is still hanging gobblers in the apple tree. Each of my hunting buddies that meet him or hunt with him learn something. He is one of those guys that says things that you have never heard anyone else say about turkeys. He understands them and approaches them for what they are, a bird. A mid-May morning in the coalfields of southern West Virginia is like no other place on earth. Christian Mountain is a beautiful place; the valleys are gorgeous and from the creek bottoms the hills go straight-up to narrow ridges several hundreds of yards to the top. “You don’t start hunting turkeys in the creek,” he said. Lesson #1. He told me, “We are going to get on top and listen into River Laurel.” River Laurel is a long hollow that stretches several miles. The two ridges that form the hollow run perfectly parallel to one another. We traveled the “short-cut” to the top of the ridge and he turned the truck off. We hopped out, and he owl hooted. A turkey straight across from us answered. “He sounds close, but we have a long ways to go to get to that turkey,” he said. We jumped in the GMC pick-up truck and started towards the turkey. At first, we drove directly away from the turkey for a few miles, crossed the hollow for about a mile and then went back down towards where the turkey was gobbling for two miles. When the bird first gobbled, he sounded so close, he was, “the way the crow flies.” But to get to him on foot or in an automobile was a long trip through some rough country. All of this land is coal company hardwoods. Every person in the county has access to this property. That is the bad news. The good news is, so do you. We parked the truck and walked over a mile and arrived on a ridge that had a small hollow dropping off to the right. It was straight down. “He should pop-up right there,” he said. Set-up at this tree and point your gun down the ridge and sit still.” So I did. The turkey still hadn’t gobbled. I can’t relate what walking a mile in the coalfield woods of West Virginia is like. It is thick and steep, very steep. He set-up about ten yards behind me and started calling on his mouth call. That was the only call he used. He scratched in the leaves and called again. No response. After about ten or fifteen minutes, my arms became tired. I eased my gun down between my legs. When I did, I heard a twig snap. At ten yards, there was the gobbler. Looking all over the place. He looked at me, he looked passed me, he looked all-around as he walked from right to left across the narrow ridge. He was so close I could see his eyes blinking. That’s close. To this day I still use that as a judge to determine whether or not a turkey is really tight. Finally he walked out of sight and left forever. My first turkey was silent. He hadn’t gobbled since we first heard him from across the ridge at daylight. I was shook, big time! I don’t think that I had ever been that excited while hunting. Every fiber in my body was shaking. Instantly, I was in love with turkey hunting. I went on to become a contest caller and videographer. I am a world and two-time turkey calling champion. I have placed in multiple divisions of the NWTF Grand Nationals nine different times. 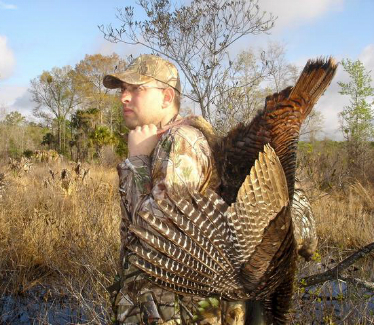 This one experience propelled me into a life-long pursuit of the wild turkey. There is nothing like it. However, that is not the moral of this story. My dad was a non-hunter. He was a coal miner and worked in the mines for 35 years. He didn’t have the time-off to take me hunting. Most of the hunters were on my mother’s side of the family and these are the folks that introduced me to hunting. Uncles and cousins were the ones who taught me about mother-nature and the outdoors. My dad took me squirrel hunting a few times but that was about it. He just didn’t have a passion for it. When I started turkey calling in the 1990’s, my dad was always supportive. We traveled all over the country to towns large and small. We went to Indianapolis, Charlotte, Nashville, Birmingham, Atlanta, Hazzard, Logan, Charleston, Point Pleasant and Flatwoods to name a few. Once he was exposed to this “culture” of turkey hunters, he asked if he could come along with me on a turkey hunt. This was around the mid 1990’s. He started tagging-along and filming with a VHS camera. We were even able to capture a few hunts on film. A couple of years later I convinced him to put down the camera and pick-up a shotgun. He shot his first turkey and it was all over. He too felt the same passion I did for spring turkey hunting. Now, he is only short a Rio Grande for his grand slam. We will be leaving for our annual trip to Florida later this month. Sometimes traditions get passed-up, not passed-down. This is how it happened with my dad. I introduced him to turkey hunting. He is a turkey fanatic now and continues to hunt with others and anticipate opening day the same way that I do. We have been turkey hunting together for over 20 years now and we anticipate opening day all the same. Take someone turkey hunting this spring. It is one of the most rewarding things you could ever do. It doesn’t matter how old or young they may be. It is one of the most important things that we can do as hunters, spread the sport to those that have not experienced it.